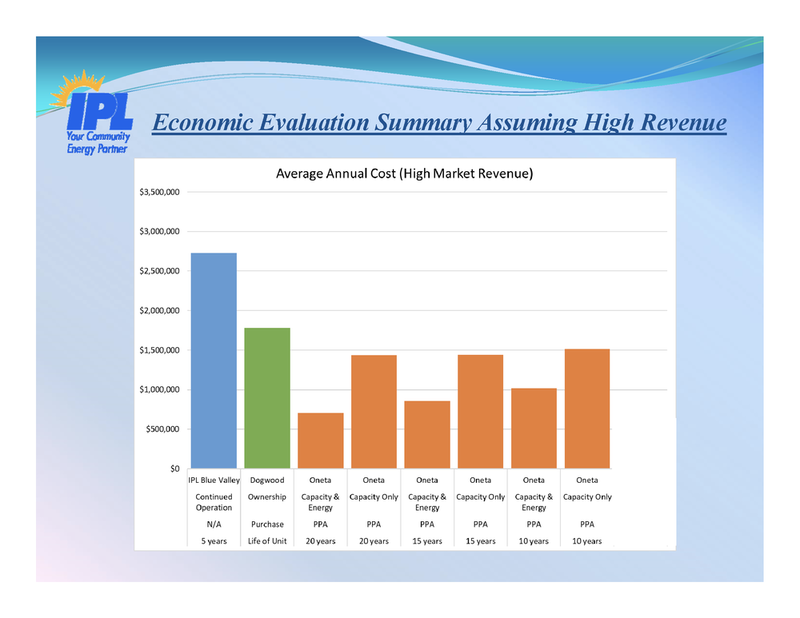 Update (4/19) - Detailed financial information on two major options were provided to the Public Utilities Advisory Board showing the comparative costs between contracting with energy from Oneta (located in Oklahoma) and Dogwood (Pleasant Hills, Mo). Indy Energy also submitted written public comments to the utility board. IPL is moving closer to closing the 98 MW city-owned Blue Valley power plant by securing additional long-term capacity when the city-owned power plant on Truman Road is closed. A resolution to close Blue Valley was considered by the City Council in December 2018, but delayed while the utility figure out how to replace generating capacity that would be lost to the plant closure. The Public Utilities Advisory Board (PUAB) this week voted 5-1 in favor of an IPL staff recommendation for a 20-year contract to purchase capacity only from Oneta Power effective June 1, 2020. Here's a copy of the April 8th presentation to the City Council. Here's the video of the PUAB meeting. Uploaded by City of Independence, Missouri on 2019-04-09. The advantages, cited in the staff recommendation, were fixed pricing for 20 years with the ability to annually adjust contract capacity to meet actual capacity needs. This was the unanimous recommendation of the seven-member staff Evaluation Committee. Oneta Power is a 1,133 MW a natural-gas fired combined cycle plants outside Broken Arrow, OK built in 2002. This is an important decision for IPL. Going with Oneta would reduce long-term costs because Blue Valley is old and inefficient. It would also reduce IPL power production staff by over 20 employees with significant annual savings of over $3 million. Plans would have to be made for staff who lose their power plant jobs. The Oneta recommendation will be presented to the City Council at a study session and a vote expected in May. Some City Council members have favored increasing the city’s ownership interest in the nearby Dogwood Energy Center, located in Pleasant Hills, Mo. IPL already has a 12.3$ ownership interest in Dogwood which is 75 MW. Dogwood proved to be a more expensive option the Oneta. IPL staff told the PUAB Dogwood had only been profitable in one of the previous 36 months and had higher annual operating costs compared to Oneta. The Dogwood option involved taking a larger ownership interest in the natural gas plant located in Pleasant Hills, Mo. which would need to be financed. Read more about Dogwood. IPL already owns 12% of the plant and a larger investment represented potentially larger risk if there was a catastrophic plant failure and the city would also incur the cost of ongoing maintenance and operations costs as well as decommissioning when the plant was decommissioned. Both Dogwood and Oneta were built in 2002. The city received seven proposals for replacement capacity. Some offered capacity only, some contracted capacity and energy and capacity and energy through ownership.